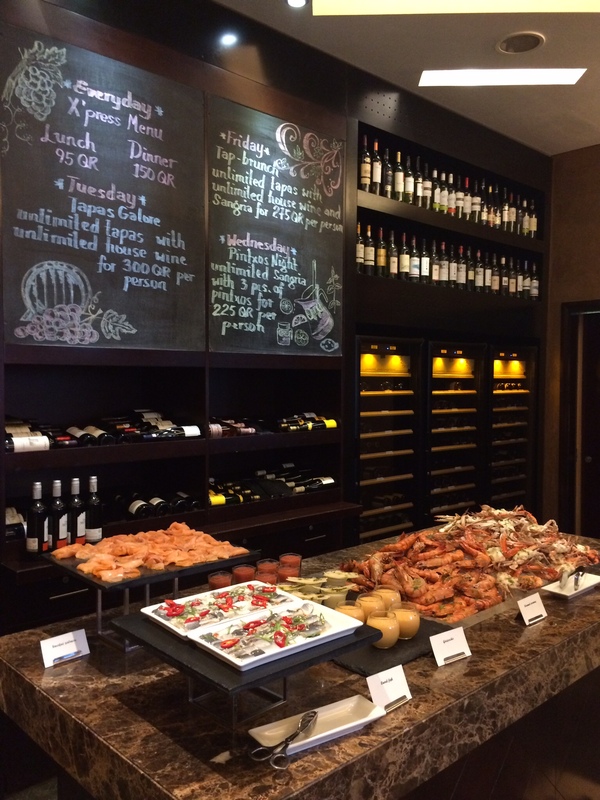 A baby shower was being organised for a friend and colleague and suggestions for a venue were asked for – nothing ‘ too baby showery’ or an afternoon tea – so I mentioned The Cellar at the Oryx Rotana. I had been previously for the tap brunch and really enjoyed it and felt this would suit the mum to be. As we were a large group a deposit was asked for, liaising with the restaurant was good, they advised a visit beforehand to check the tables were laid out properly and to finalise details. When I arrived many other friends and colleagues were already tucking in and despite a couple more people than anticipated joining us Elsa the manageress dealt with setting up more table and chairs quickly. I like the lay out of this brunch, its is quite a small room with the food and drink as you enter then you walk through to the seating area and bar, it feels really cosy but not too small for a group of 20+. The music isn’t too loud so you can hold a conversation and the dark wood and low lighting creates a calm ambience. 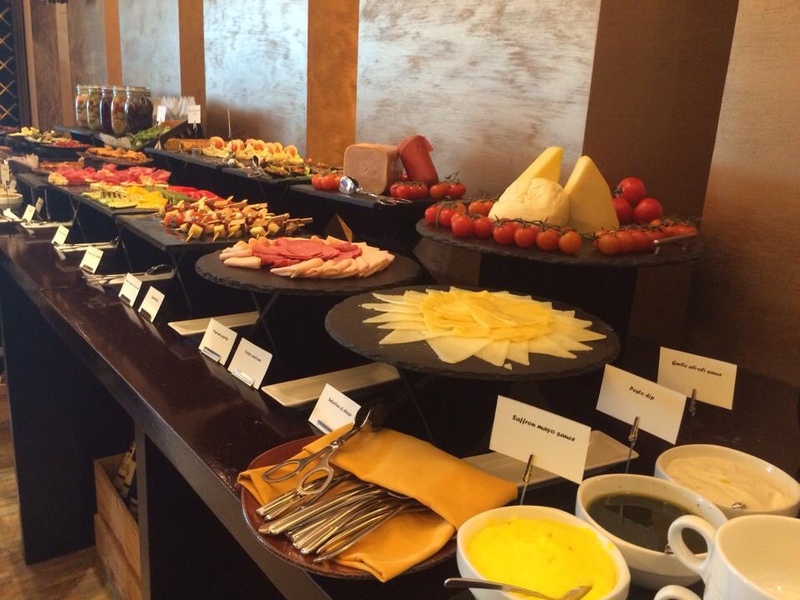 There was a wide selection of cold tapas including cold meats, seafood, salads, breads, bruschette and kebabs which you can help yourself to. After about an hour or so we were served 3 individual hot tapas and paella and after a while each table was also given a platter of beef steak, black cod and a pasta dish to share. The food was fresh, hot and well cooked and it offered a good variety to suit every taste. You could ask for more hot tapas at any point and the staff were very friendly and efficient, I particularly liked the black cod and got another serving and I would definitely order this off the main menu if it is available when I go again. 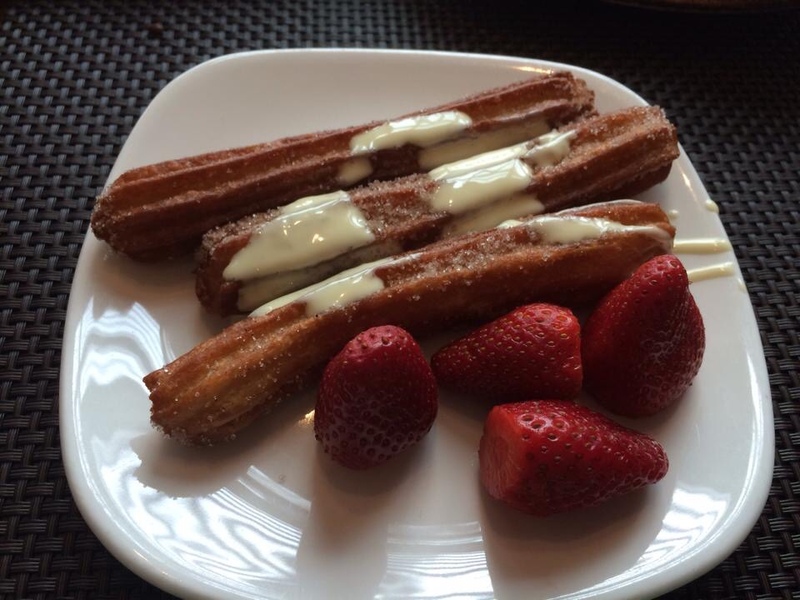 Eventually we moved on to desserts and I think I ate the majority of the churros dunked into melted milk chocolate – they are very moorish. There were also fruit tarts, cheesecake, mousses and sponge cakes in addition to lots of fresh fruit for those being a little bit healthier. 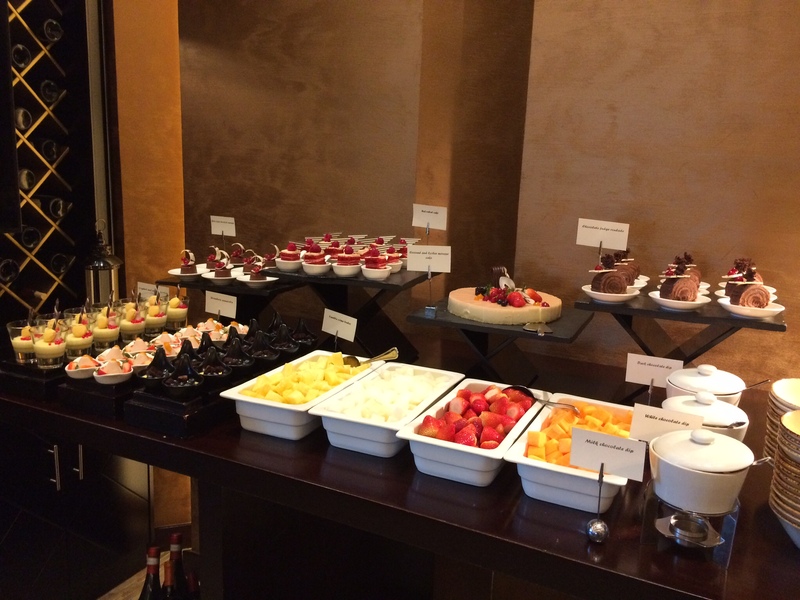 Drinks were served to the table continuously – unlimited wine or a variety of sangria flavoured with different fruits. I stuck to the strawberry sangria which was very sweet and not too strong and I was told the wine choices were very good. One small gripe and perhaps a misunderstanding on our part was that if you were paying for food only no drinks at all were included not even water. If you don’t opt for the drinks package remember to factor in the cost of water and soft drinks into the overall bill – our mum to be and other pregnant ladies were able to adapt their drinks package but you may want to confirm this with the restaurant first. I was relieved that everyone seemed to enjoy the food and drink – its always a bit of pressure when its your recommendation! 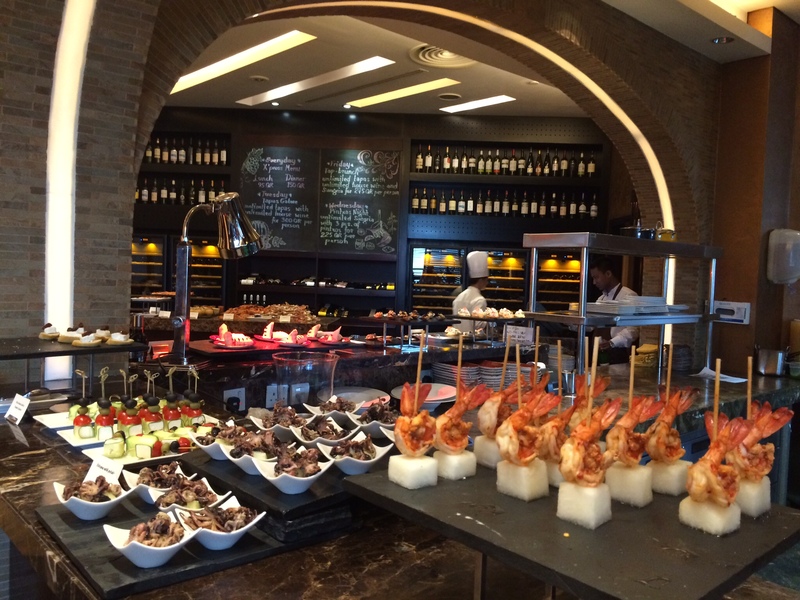 The tapas brunch on a Friday costs 275QR with alcohol or 175QR for food only. I think this is good value for money and its a lovely place to go as a couple, small or large group. Throughout the week the restaurant has a variety of promotions such as an express lunch with 3 courses for 95Q and those who work in education can also take advantage of a 20% discount on a Friday if you take ID ( can’t be used for the brunch!). I will definitely go back and I hope other people who attended the baby shower will too.